A while ago I created a piece titled "Loaded for Bear", which depicts a pair of P-47D fighters loaded with ordnance, flying low over the German countryside. 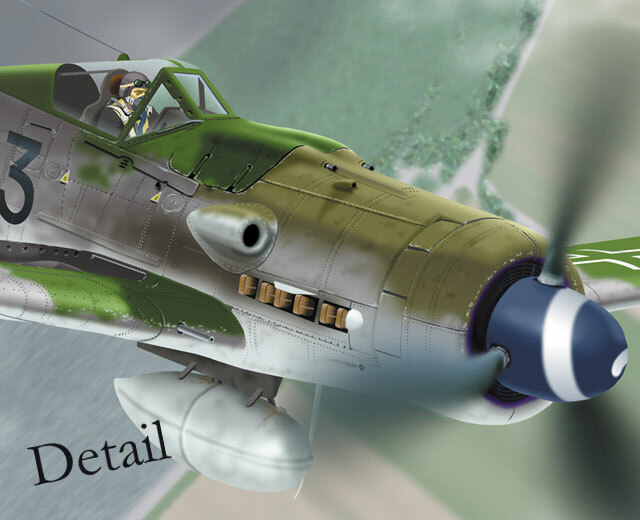 This illustration is the other side of the coin and depicts a Ketten of Fw190D-9 fighters of JG26, also sweeping low over the German countryside. 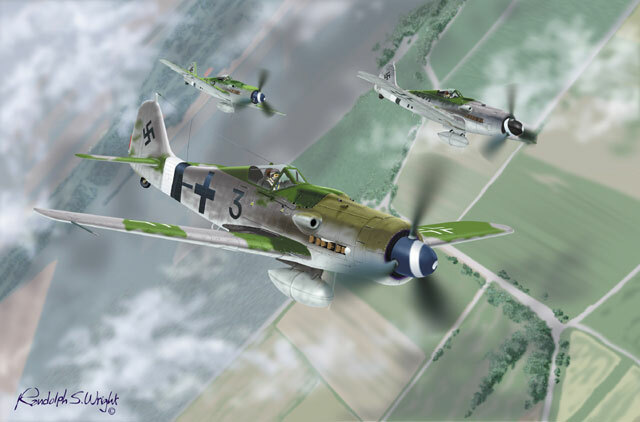 This piece is titled "Focke Mustangs" in reference to a nickname some front-line Luftwaffe pilots gave their Fw's. While arguments can erupt when comparing the Fw190D-9 vs. the P-51, they both were superb warplanes in their day. I have included an overall image of the piece plus a detail from the center of the composition. I offer both prints and original art for sale and I can be reached through my web site at: http://home.earthlink.net/~warbirdsart . The site displays a variety of art subjects ranging from aircraft to steam locomotives.